The BAC met this past Tuesday night, like they do every even-numbered month. This month, the BAC held elections for 2-year officer terms. In a tight vote, Jay Slater (former Vice Chair) was elected the third Chair in BAC history. Come follow us below the fold as we cover the election results, an update from the estimable Sergeant Krumer, the latest results on a zoning change to require more bicycle parking, the Bike Plan Implementation Team, reports from the subcommittees, and various other agenda items. Sergeant Krumer noted that the most recent ride of Critical Mass saw no significant conflicts between riders and officers. In fact, LAPD was beginning to adjust and standardize their presence at Critical Mass rides. While in the past, LAPD experimented with different officer deployment, it looks like the department will move forward with 40 officers on bike and 40 in patrol cars. Sergeant Krumer was quick to assure the BAC that those officers assigned to Critical Mass will in no way effect patrol duty and rotations across the City. LAPD is offering information and collaboration with LBPD about how to appropriately work with Critical Mass rides. LAPD has supplied Long Beach with a copy of the training video they currently use for Critical Mass (Joe Linton offered to convert the video into digital form so LAPD can post it to their website). Additionally, Long Beach has agreed to return the bicycles that their police confiscated during the last Critical Mass ride. LAPD will step up enforcement of the bike lanes on Wilbur Avenue after reports that impatient drivers are using the bike lane as an extra lane of travel. Glenn Bailey, being extremely familiar with Wilbur Avenue, offered to supply Sergeant Krumer with the times of day most likely to see drivers in the bike lane. Sergeant Krumer encouraged bicyclists to file complaints against officers who treat them poorly. Even though complaints may be dismissed, Sergeant Krumer stressed the importance of building of a case file of complaint history. Sergeant Krumer also updated the BAC on LAPD’s request for clarification on the legal definition of “crosswalks”. The current language in the California Vehicle Code says bicycles may ride “along” crosswalks, but LAPD is unclear how exactly to interpret “along”. LAPD had asked for clarification from the State Attorney General’s office, but hadn’t received a response before then-Attorney General Jerry Brown was elected to Governor. LAPD is now reaching out to current Attorney General Kamala Harris to provide direction. Next was a presentation by Rye Baerg on the City’s proposed bicycle parking ordinance. Rye is both an intern at City Planning and the new intern for Metro’s Bike Program (a position formerly held by new LADOT Bike Program Coordinator Nate Baird). Any new multi-family residential, manufacturing, or commercial space would be required to provide bicycle parking. A major remodeling or a change of use would also require installation of bicycle parking. Any new residential building with 3 or more units would be required to provide bicycle parking. The ordinance would require both short-term and long-term parking. The details and requirements of each are still being hammered out. 1 long-term space will be required in residential for every 2 units. City Planning won’t prescribe a specific form of bike rack because they want to encourage innovation and creativity for the installation of bicycle parking. They will only demand that the parking is safe and has at least 2 contact points with the bicycle to ensure the bike can be safely locked. We should emphasize that the bike parking ordinance was a working document when Rye gave his presentation; some details may change in the official draft. The LACBC put together an excellent post when the draft ordinance was released for comment earlier this month. You can also read the draft ordinance for yourself. Next up was a report on the Bike Plan Implementation Team. Although the BPIT is probably old hat to you savvy bike folks by now, the group had only convened their first meeting a few hours before the February BAC meeting. After the “Top 10” project list was laid out, BAC members discussed the need to work closely with Council Offices, Neighborhood Councils, and community groups to build support for the projects. A special thanks also goes out to the BAC for prioritizing Lankershim Boulevard, Barham Boulevard, and Cahuenga Boulevard on the Top 10 list. These projects are adjacent to the NBC/Universal project, whose current plans may preclude bringing bicycle infrastructure to these streets in the future. None of these streets were in the top priority list before the first BPIT meeting, but the vigilance of the attending BAC members brought this potential conflict to the attention of the City. Although BAC officers serve 2-year terms, the BAC Chair was originally appointed by the Mayor’s Offce. As such, only one person had served as BAC Chair from its founding until two years ago: Alex Baum. Two years ago, Glenn Bailey was elected as the second-ever Chair of the BAC. His estimable efforts brought more attention to the BAC than the group had ever experienced. February marked the end of his two-year term, and the group proceeded with an election for all of their officer positions. For the position of Chair, both Glenn Bailey and Vice-Chair Jay Slater were nominated. Glenn started off by stating his desire for the role of Chair to change hands every 2 years, bringing new energy and points of view to the BAC. Towards that end, he promised not to run again 2 years from now if re-elected. He touted his achievements for the BAC and for the Los Angeles bicycling community. He stressed the importance of the BAC not becoming a “rubber stamp” for the City and for the BAC to act it’s part as the only official voice for bicyclists with the City. He envisioned the BAC taking bicycle advocacy directly to the communities of Los Angeles at Neighborhood Council meetings. Glenn himself had attended over 30 different NC meetings during his tenure as BAC Chair. Jay started his speech by first praising Glenn’s contributions over the last two years and expressing his own ambivalence with running for the BAC Chair until convinced by other BAC members. In outlining what he considered a different vision for the BAC, he stressed the need for change. Jay imparted the stark reality that, to him, the BAC had become “an afterthought” in the bike community that often does nothing more than “write a letter” to the City when they object to a specific project or program. Jay instead proposed closer working relationships with LADOT and City Planning in order to insert the BAC more directly into implementation of the bike plan. He envisioned growing the BAC into a “powerful force” within both the City and the bike community and tapping into the skills of capable BAC members like Glenn Bailey, Kent Strumpell, Jeff Jacobberger, and Joe Linton. After each nominee spoke, a vote of 7-6-1 elected Jay Slater as the new Chair of the BAC. Subsequently, Glenn Bailey was unanimously elected BAC Vice Chair. Kent Strumpell retained his chair of the Planning Sub-committee and Jeff Jacobberger joined Joe Linton as co-chair of the Bikeways Sub-committee. The group also discussed assigning non-active members of the BAC to attend sub-committee meetings randomly in order to further encourage their participation. After the election, there wasn’t much more news to cover at the BAC meeting. Both sub-committee chairs gave reports on their latest meetings, though you can always read up on the LADOT Bike Blog’s notes of each meeting if you’re interested. 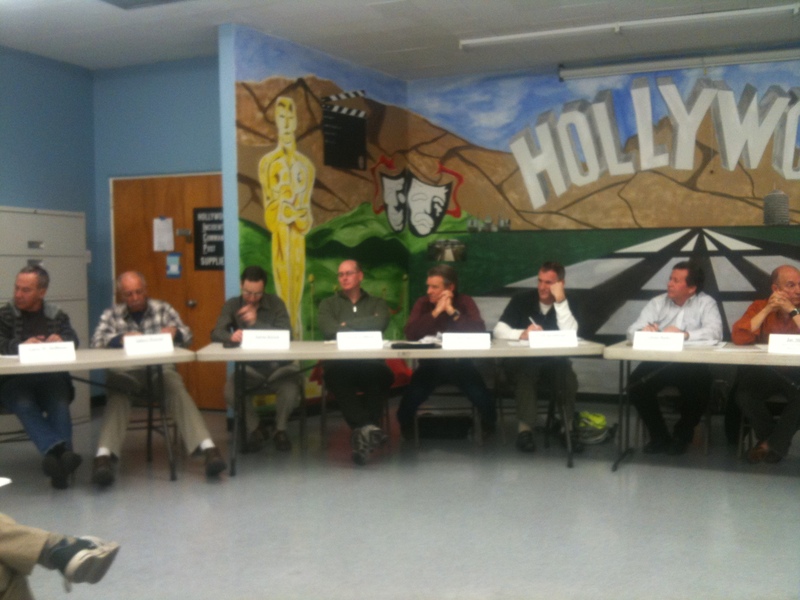 The Planning Subcommittee met on January 11th and the Bikeways Subcommittee met on January 25th. LADOT: Sharrows installed on Adams Blvd. LA’s First Bike Corral Now Officially Open for Business BPIT’s “Top 10”: How Would You Build 7th Street?